Join our community of Bordeaux-lovers and learn about premium wines, lifestyle and culinary experiences, because you want to be the first to know: It’s fun, it’s easy and it’s free! Excitement is building around preparations for the Fete de la Fleur, to be held as Vinexpo’s closing event at Château Malartic-Lagravière on 21 June. 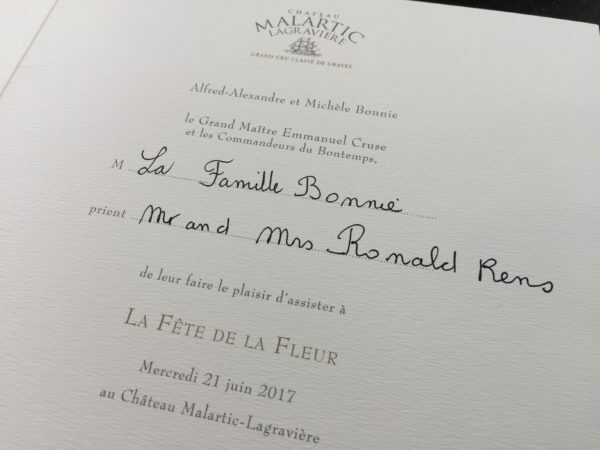 To welcome the 1,500 select guests invited by the Commanderie du Bontemps, the Bonnie family – owners of Château Malartic-Lagravière – is planning a truly memorable event in covered marquees at the heart of their vineyards. From the top of the famed Malartic gravel hillock, guests will enjoy a 360-degree view over the vineyards, Château and estate buildings. Rarely has a gala evening of this magnitude been laid on at such close quarters to the product it celebrates, the vine flower. The owners achieved this coup by bringing forward their replanting programme scheduled for the next three to five years, and tearing up 13,000 Merlot vines (1.30 ha). The plot will be replanted in early July with Cabernet-Sauvignon, a grape variety perfectly suited to the superb gravel soils on the hillock. The Fête de la Fleur is above all a celebration of great wines. The Bonnies worked with illustrious chef Yannick Alleno – whose two restaurants have earned three Michelin stars – to devise a menu pairing each wine with each dish. In order to better showcase these prestigious bottles, each wine will be served with its own music specially chosen and performed by the internationally renowned Modigliani Quartet. This celebratory evening also has some surprises in store! For one thing, the Bonnies naturally called on the de Nonancourt family – owners of Laurent-Perrier Champagnes – as partners for the after-dinner interlude set in the Château gardens. The two families are linked through the estate’s history. Bernard de Nonancourt first met Alfred and Michèle Bonnie in late 1996, when the Château was for sale. In early 1997, Mr. de Nonancourt handed the keys of Malartic-Lagravière to Alfred Bonnie with great emotion, as he was very attached to the property. 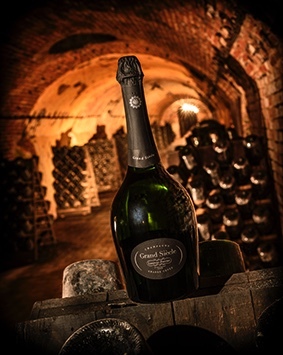 Twenty years on, Alexandra and Stéphanie de Nonancourt will serve the 1,500 guests magnums of the superb Grand Siècle cuvée. 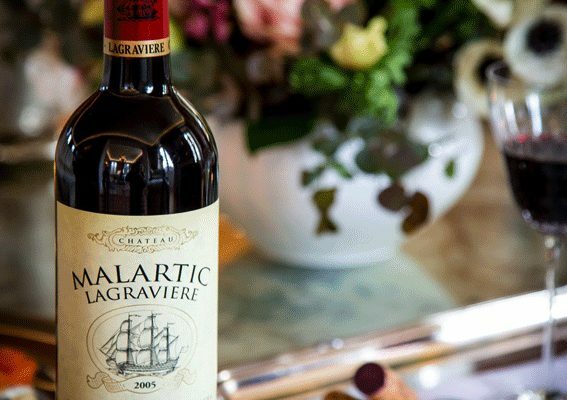 The Bonnie family have poured their energies and passion into constantly perfecting Château Malartic-Lagravière wines since 1997. With their team they produce complex, balanced and elegant wines, so tailored they can be considered ‘haute-couture’. 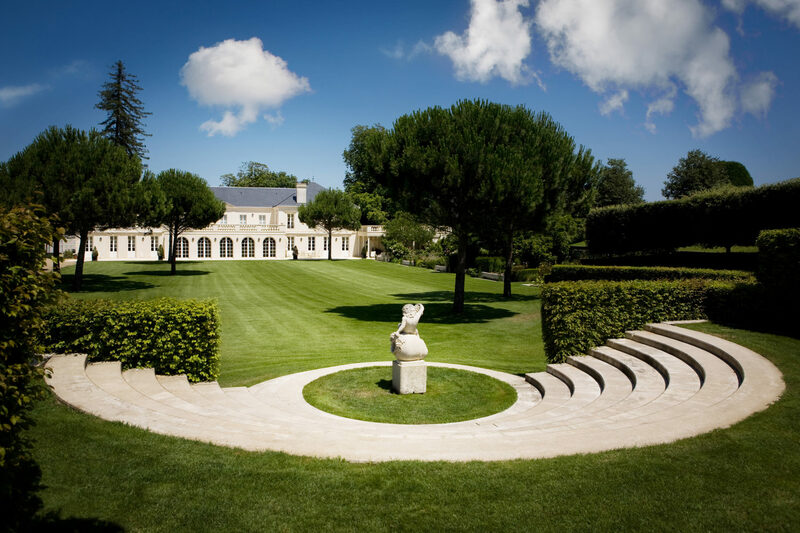 The estate stands on an exceptional terroir of centuries-old renown, initially known as Domaine de La Gravière under the ownership of Count Hippolyte Maurès de Malartic’s family. It took its current name of Château Malartic-Lagravière in 1850. Only three families held the reins from the 18th century, until their successors the Bonnie family elevated the estate to the prestigious position it enjoys today. This year marks the 20th anniversary of the family taking the helm. Grand Siècle by Laurent-Perrier: A reproduction of the perfect year. Nature will probably never provide the perfect oenological year, but the art of assemblage allows us to approach this ideal. Going well beyond rare vintages, Grand Siècle is an innovation borne out of great discernment. Made up of not one but three exceptional vintages that complement each other perfectly, assembled exclusively from 11 of the 17 Grands Crus and benefitting from extensive cellar ageing to ensure the same style every time. The Quatuor Modigliani has acquired a place among the quartets most in demand. They are regularly invited to the most prestigious international venues and venues all over the world. Since 2011, they have been the artistic director of the Evian Festival, a major festival in Europe.